Je me souviens (I remember)…When I arrived in Quebec in 1986, these words from singer/composer Richard Séguin well described the new world I was discovering. A world where artists defined themselves by the exploration of their own voices and authenticity. This statement truly inspired me and forged my personal path and artistic vision. My parents are Indian and Armenian, I was born in England and I grew up in Saskatchewan. I always felt unique but paradoxically, I knew very little about my roots. This is where I got my drive to re-appropriate what had been forgotten : my Indian heritage. This is the path that lead to Burning Skin and to the rest of my creations! I would like to express my infinite gratitude to the talented and dedicated artists, collaborators and partners who, since 1991, have nourished Sinha Danse with ENERGY, DARING and DIVERSITY. Sinha Danse is a professional contemporary dance company based in Montreal and founded in 1991. The company’s mandate is to create, produce, present and promote contemporary choreographic projects inspired by the Indian cultural heritage of its founder. This goal is characterized by the fusion of interactive body expressions, culture and technology to connect with as broad an audience as possible while offering them a singular dance experience. The creation of Sinha Danse came about due to the need of its founder to reclaim his Indian heritage and make use of the tradition using contemporary expression. The company explores a universe forged from contemporary dance, Bharata Natyam (traditional southern Indian dance), martial arts, theatre and slam. Stories hold an important place for Roger, especially those of authors, poets, travellers and the story of the choreographer himself. Making use of irony and poetry, the pieces are created with energy and daring while perusing human existence and celebrating its universality and its diversity. Roger Sinha’s works take a critical look at current events, racism and culture shock. Over the last few years, the company has sought to focus on the integration of new technology and the creative interdisciplinary process, alternating and associating interactive technology, video and music.Pursuing the idea of a discussion with the audience, Sinha Danse is resolutely focused on the evolution of dance as a form of art. Roger was born in England to an Armenian mother and an Indian father and later moved at the age of eight to Saskatoon, Saskatchewan. After graduating from Toronto Dance Theatre, he settled in Montreal and quickly became involved in several collaborations within the blossoming local artistic community. In 1991, he formed his company Sinha Danse and began developing his distinct choreographic language based on an intermingling of his Indian background and Canadian culture. More than 30 shows were on tour across Canada and overseas. His creations unite Bharata Natyam, a dance originating in Southern India, martial arts and contemporary dance. This unique fusion of influences has given birth to hybrid choreographies that are unquestionably distinctive. Roger Sinha has over twenty dance creations under his belt, often integrating technology and interactive media into his performances. A renowned choreographer, he also works regularly with sponsors including Tono (2008 Peking Olympic games, the Vancouver Winter Olympics and the Expo 2010 Shanghai China). His works also include Burning Skin (1992, 2015) Borders (2004), Benches (1996), Loha (2000), Thok (2002), Apricot Trees Exist (2004), Zeros & Ones (2008, 2015), Thread (2008) and Asphalt Tango (2014), just to name a few. Roger Sinha is on an indefatigable quest to retrace the imperceptible barrier between the universal and the personal using humor and poetry as his guide. He is also passionate about the video arts, producing two short films entitled The Barber of Bangalore (2008) and Haters N’ Baiters: The Culture Collision (2010) which won the Vote du Public Canadien at the Racines de Radio-Canada International contest in 2010. Roger is also regularly asked to teach at various institutions including École de danse contemporaine de Montréal, Winnipeg’s Contemporary Dancers and at the School of Toronto Dance Theatre where he has also produced exclusive works. He has taught adults, children and teenagers. 2013 marked the success of Sunya which combined four dancers and the acclaimed musical ensemble Constantinople. In 2014 Hi5 Lo5 Wifi Takka Takka Dhim uses humor and derision to discuss themes of intimidation and intolerance among adolescents. In 2016, Roger Sinha dives into the community, producing a large-scale project entitled MoW! – Montre(olly)Wood. This new work combines western contemporary dance and Bollywood dance with nearly 90 non-professional dancers. The show was presented on July 1 in Longueuil for the Canada Day, in front of over 1,000 spectators. 2018 Charles-Biddle Award winner, national and international scene: given by Culture pour tous and the MINISTRY OF IMMIGRATION, DIVERSITY AND INCLUSION (MIDI). Watch Roger’s video testimony made by LA FABRIQUE CULTURELLE. Arts & Culture Lys TROPHY (2017): GIVEN AT THE GRANDS PRIX MOSAIQUE’S GALA for his work MoW! promoting inclusion and outreach of diversity in all its forms. Cultural Diversity Prize in Dance (2016): PRESENTED BY the CONSEIL DES ARTS DE MONTRÉAL, FOR PRIX DE LA DANSE DE MONTRÉAL. Kathryn Ash Choreographic Commission (2011) : Offered to a selected choreographer by the School of Toronto Dance Theater to create a production with students. Prix du public canadien at the Racines de Radio-Canada International (2010) contest : For videodance, Haters n’ Baiters: The culture collision. Multicultural Short Film Festival, New York (2009) : The Barber of Bangalore which was selected as a finalist. Prix Dora Mavor Moore (2004) : Nomination of Thok in the best new choreography category. Candance creative funds (1999) For Glace Noire. Candance Creation fund (1995) for From a crack in the Earth… Light. Sinha Danse has been selected FIVE TIMES for the Conseil des arts de Montréal en tournée for : Loha/Thok, Apricot Trees Exist, Zeros & Ones /Thread, SUNYA (2014-2015), Tope là, Tope ci, wifi takka takka dhim (2015-2016). Tono was presented during the 2010 Vancouver Olympics’ Cultural Olympics as well as at the Expo 2010 Shanghai China. Sinha Danse’s first tour of India : 5 cities, 6 shows, (2009). Report on Roger Sinha : Freedom, Bravo Television, (2007). Television adaptation of Thok for Dance with me, Bravo Television, (2005). Pierre Elliot Trudeau Foundation Sponsorship for Borders and the Blind Men Who build them, (2004). 2002 Dance critics choice, La Presse. Television adaptation of Burning Skin for the CBC series In Performance, (1994). Burning Skin tours twice in England (1993 and 1994), also presented at the Indian Dance Conference (New Delhi, 1993) during Roger’s first tour in India. Roger Sinha, founder of Sinha Danse, choreographer, dancer and teacher. With over twenty creations to his name, he has contributed to the enrichment of dance and the Quebec arts community for over 25 years. 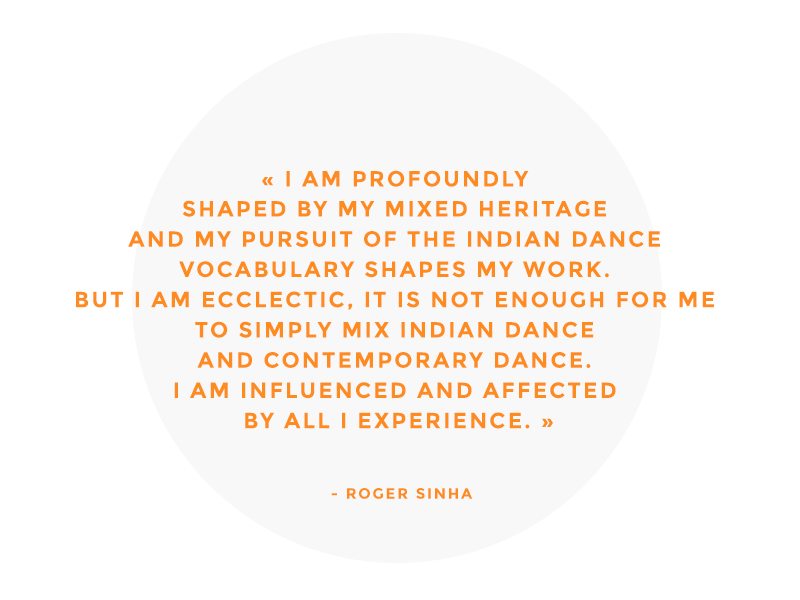 Roger is a visionary, taking a singular approach that combines traditional Indian dance, contemporary dance, and martial arts as well as theatre and new technology. His passion is undoing the divides between the East and West. He is renowned for his commitment to cultural diversity, Roger is tirelessly redrawing the imperceptible boundary between the universal and the personal. See full biography. Mariya Moneva is a cultural management specialist who works mainly in the field of performing arts in Montreal and internationally since 2007. She holds a Master’s degree in Cultural Studies from the University of Sofia and a Diploma in Arts & Cultural Industries Management from HEC Montreal. Her expertise is substantial – she has lead 33 international tour projects in 23 different countries for the worldwide-renowned company Cirque Eloize, and through the years, has participated in the production of many shows, exhibitions and other artistic events in the Montreal area. Being herself a big supporter and admirer of dance, she joins with much enthusiasm Sinha Danse in 2017. Bachelor of UQAM’S unique Cultural Promotion and Research program, a Dance Degree, and many years of Bharata Natyam studies with Marie Roux, Sandra yearns to elevate the acknowledgment of dance through multiple actions, notably by being Vice-President and organizer of Quebec’s Association for Oriental Dance (AQDO) board of directors. Passionate about culture and oriental dance (bellydance) and its many fusions since 2005, she is also part of Tribal Momentum’s festival organizing committee and was previously involved with Tribally Yours, Cabaret Danse MacabreFestival, and the Ya Eshta Collective. Working in the performing arts field for more than 40 years in Quebec, Canada, and Europe, Mr. Baland holds a Bachelor’s degree in Economics and a Bachelor’s degree in Cultural Business Management and Events communications (equivalence DESS -HEC). He quickly became director for many organizations like The Jean-Pierre Perreault Foundation, O’Vertigo, the Montreal Ballets-Jazz / Arion-Baroque Orchestra and the Quebec Association of Performing Arts and Scenographers, to name a few. Always very involved in federal and provincial political circles or social and progressive and social movements on the Island of Montreal, he campaigns every day for the artistic education of young people and for access to culture for all! Holder of an accounting degree CPA, CMA, Yan has worked for over 5 years in the arts and entertainment sector. During his professional career, he has developed extensive experience in developing business plans, financial management and preparation of financial statements. Yan is also a member of the Junior Chamber of Commerce of Montreal and was a member in the working Committee of Danse Danse and the annual benefit TUTU. Mona Sakatni is currently the Director of Solutions and Expertise for a major ICT consulting company in Montreal. Mona holds a Masters in Business Administration and has worked for nearly ten years in the IT sector where she specialized in business development. She is especially skilled in strategic planning and the creation of marketing and communications plans. She also has a wealth of experience in events organization. An experienced volunteer, she is the 2011 Hommage bénévolat Québec Award-winner and has sat on several organizational committees including the Volunteer Bureau of Montreal. Bachelor of Laws (L.L.B.) from the University of Montreal, Bénédict won numerous prizes for his involvement everywhere he’s set foot. Chronicler for ‘Arts and Law’ at CISM’s 89.3 FM Hors la loi’s radio show, intern for Hydro-Quebec’s intellectual property and holder of a diploma in Piano from the Vincent d’Indy Music School, his presence as secretary for Sinha Danse’s Board of Directors was the next logical step to his carreer. In recognition of their valuable contribution as administrators of the company, Johane Bergeron, Diane Morin and Madeleine Champagne were proclaimed honorary members of the board at the end of their mandates.